There’s a first for everything: a first step, first kiss, first job. How about a first car wrap? Many out there want to wrap their car, but they find out the price and most say no thank you. So, then it leaves themselves thinking to attempt a DIY wrap project.The internet search begins and several questions arise: Do you need special tools? Is it hard? What does it take? Is it expensive? Not many have shared their first time experience publicly. I reached out to a friend to get his thoughts on his first track, first wrapped car project. 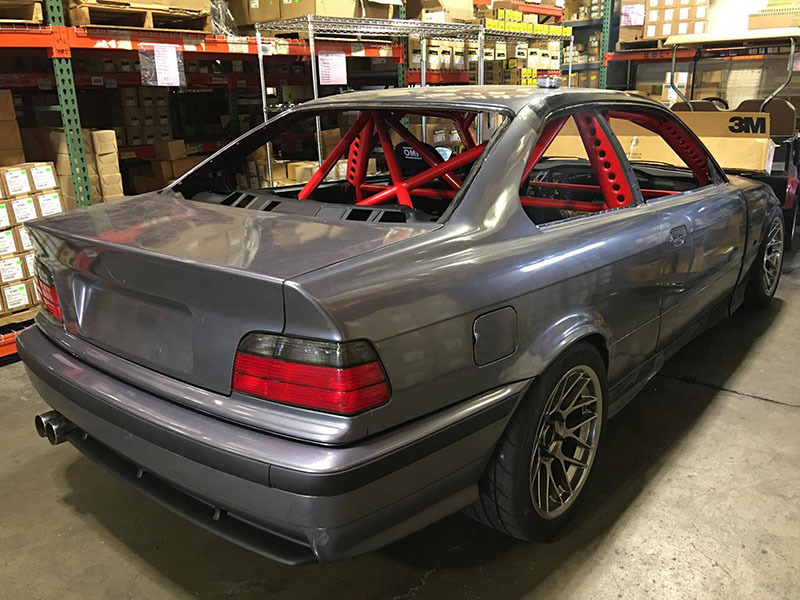 Today sitting down with Mike Bouey-Constatine he’s all smiles, Performance Technic in Dublin, California just finished up with the motor swap to his project in his BMW e36 M3. Mike’s first track car, first time wrapped car. His passion started over a decade ago with karting. Soon it moved to tracking. Where he finds himself building a track car and wrapping it himself. 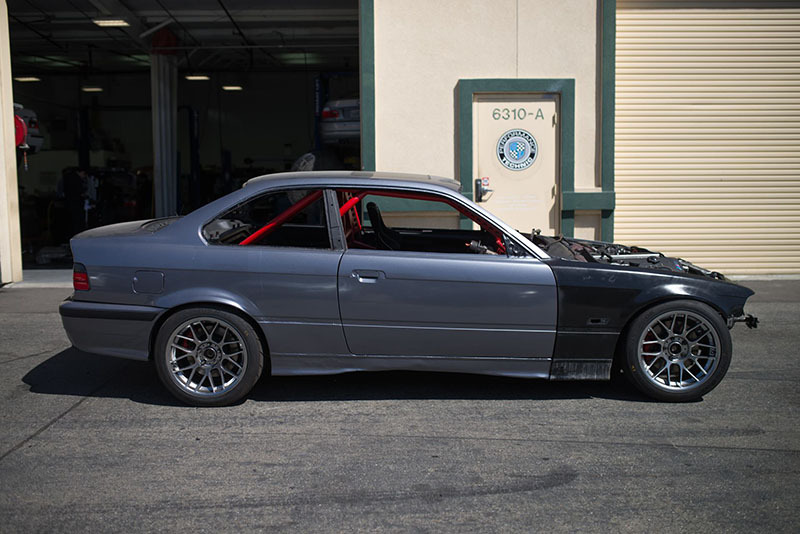 Mike is new to wrapping, so new he took a crash course on YouTube minutes before wrapping his BMW. He wasn’t too worried about if it was going to be perfect, “becauseracecar.” Mike was like many now days, not sure of it and should that leap be taken to do it? Well, Mike took that deep end plunge. He got in contact with VinylGiant.com and ordered a roll of 3M Gloss Anthracite Vinyl, and supplies. 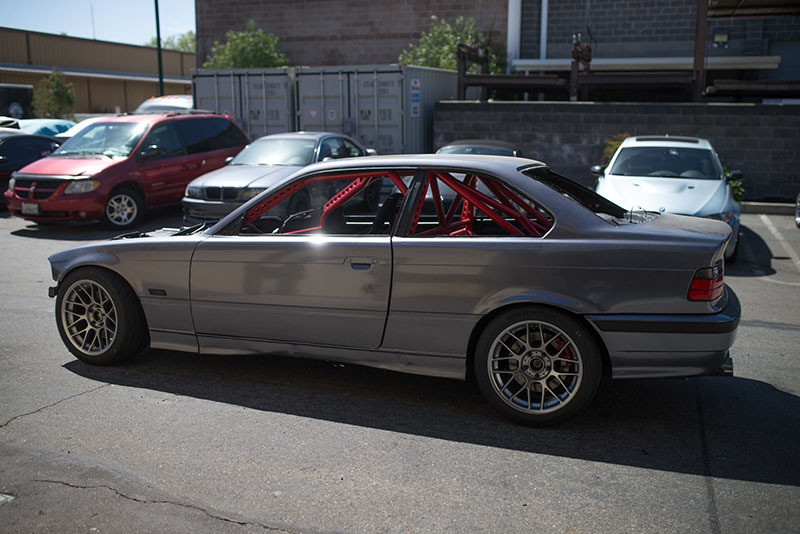 He spent around $500 for everything and one day of prepping meticulously the car for the wrap. A thorough detail is a must. Mike’s biggest worry is when it came to the wrap, was having enough material. It’s better to order more for those areas you mess up on or maybe for a touch up down the road. Even the best wrappers have back up material. No ones perfect. Sometimes with vinyl it can seem like it has it own mind too. It’s better to be safe than sorry. When it came to the actual wrapping he was worried about the sharp corners and the durability of the vinyl. Some vinyl was actually torn during the wrap due to overheating. This is when backup is nice to have. Mike quickly also learned that patience was also part of the tool box. “Be patient, it’s going to take you longer than you think. 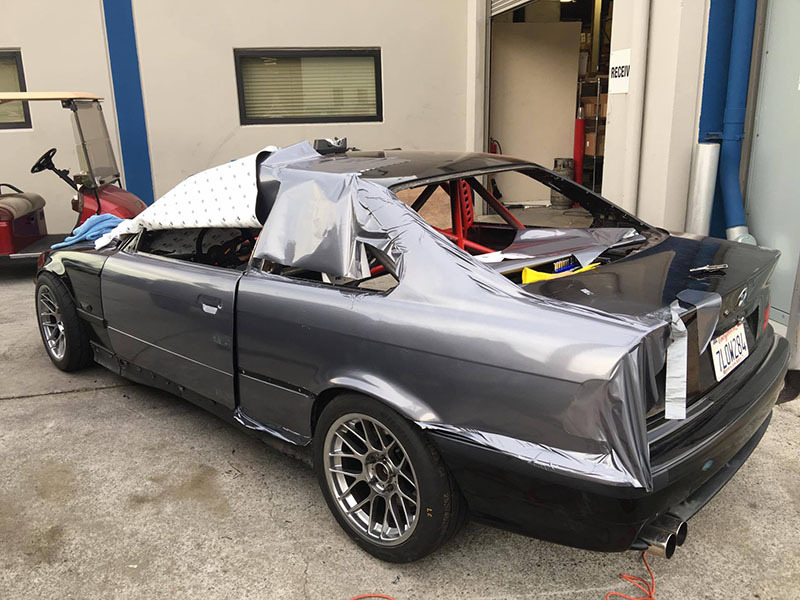 It took around 10 hours to wrap the BMW.” His suggestion is to start wrapping the hood first. He found that easiest to do. Do as much research that you can, then do some more. Make sure to get all the tools needed. He did not and found out he should of shortly after starting. Don’t be afraid to call and ask the store you are ordering from for suggestions. They are more than happy to help. Mike’s in no hurry to dive into the vinyl world, but he doesn’t mind tackling this project again for the track. For as goes his daily he would definitely have a shop do. He’s not discouraging anyone from trying. “It’s not as difficult as you think. It’s more time consuming than anything. 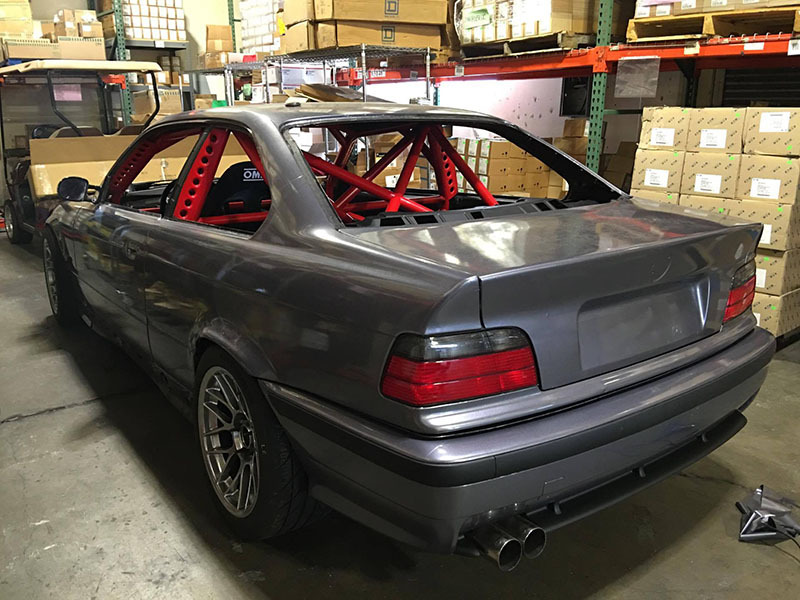 Last but not least, buy more vinyl than you think.” You can check out Mike’s BMW project at Cars And Coffee San Francisco or follow him on Instagram @SRT_M3_415. This is Trev Nish reporting for Wrapfolio, have a great drive. Special thanks to Trev Nish for the article & Performance Technic, Inc for the photos.